Forget the chocolate eggs! This Easter, it’s all about chocolate drinks for the grown-ups. The traditional Easter-egg-hunt has been ousted by the search for the perfect chocolatey cocktail -enter Be At One’s new limited-edition Easter cocktail, the Honey Bunny. 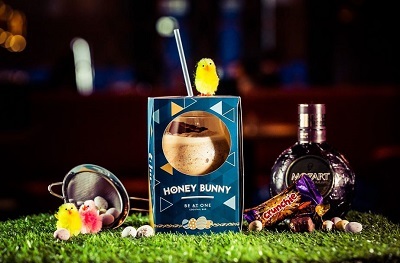 Add yourself to the huge numbers of cocktail enthusiasts sipping on the Honey Bunny, available at each of Be At One’s 33 bars across the UK from Thursday 22nd March to Sunday 15th April. I’ve already not only sipped on one, but I’ve also made one myself! So if you have a blender this will work. If you don’t have any kind of blender (even a hand blender) I’d check out some of my other Easter Recipes. Break the ice down a bit first so it isn’t big chunks and then take all the ingredients and all together blender them until you cannor head any sounds of ‘sand’ (which is either the crunchie or the ice still being broken down). Tap out (because it will be thick) into a balloon glass. Garnish with the other half of the crunchie (unless you’ve eaten it already).